Next time you dine at Hartsyard, take a look at the napery! 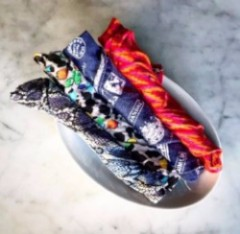 HopeforOllie was asked to supply high quality, durable and funky napkins to the award winning restaurant in November 2017 and has since become the preferred supplier to the establishment. "When you are asked by Hartsyard to make the napery for their restaurant, you happily oblige!" stated Patricia McPhail, Founder of HopeforOllie. The owners both agreed, "these are the funnest napkins we've ever had!"